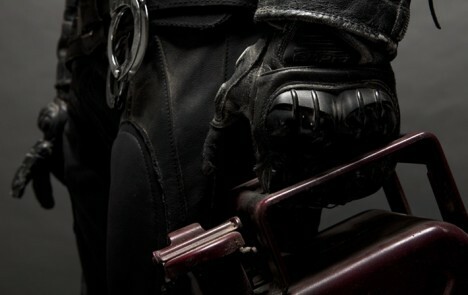 Artist/designer Dr. Romanelli collaborated with cycling gear manufacturer Alpinestars to create a collection of leather pants, a jacket, gloves and boots that were deconstructed and reconstructed into weathered road armor for Mad Max-inspired nomadic roamers. 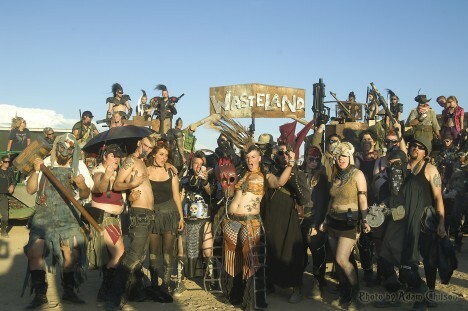 If the world were ever to become a dusty wasteland in real life, it would probably look something like this: Wasteland Weekend, a 3-day, Mad Max-inspired post-apocalyptic event taking place each September in California’s Mojave Desert. 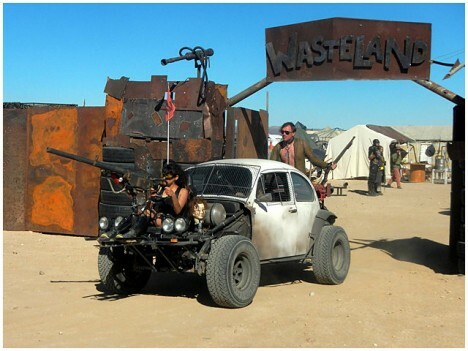 Costumes are mandatory and plenty of people spend months creating their own custom vehicles, Burning Man style. 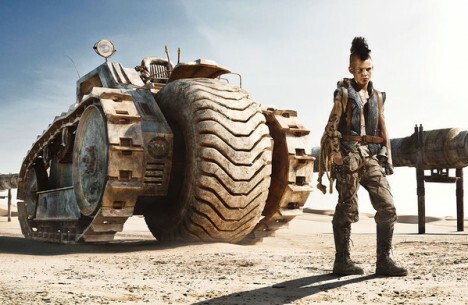 It’s essentially one big fashion show for people who want to live out the fun parts of the films, tossing metal boomerangs and holding barbecues. 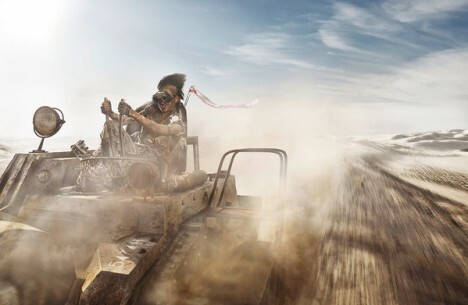 Kids in post-apocalyptic rags tear around the desert in miniature Mad Max vehicles in ‘Promised Land,’ a narrative photo series in which “a young boy encounters a foreign tribe of kids.” The images were created by adNAU and Achim Lippoth for Kid’s Wear magazine, combining CG landscapes with photography. 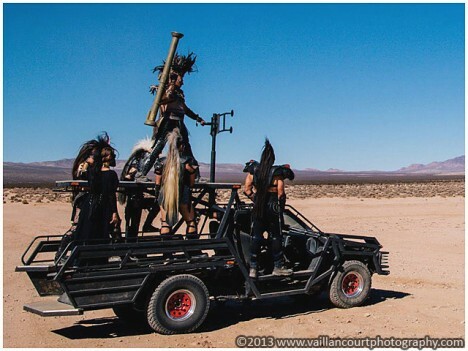 The Monster Carlo is one of the crazy vehicles designed for Wasteland Weekend, decked out with two extra fuel tanks, a saw blade-throwing slingshot on the roof and a truck bed full of weapons. 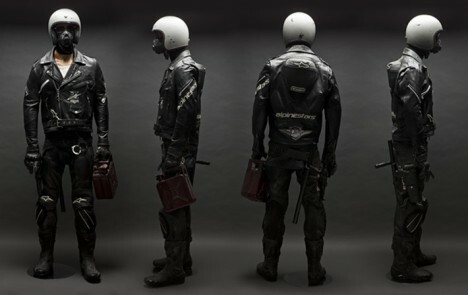 Fittingly, creator Ron Griffiths has a day job repairing cars. 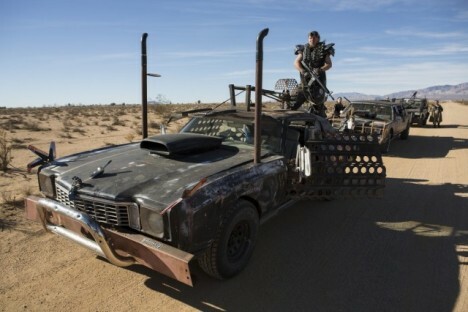 He chose not to up the performance of the Monte Carlo he used as a base for the build, saying it makes for a vehicle that’s easy to fix and maintain in the desert heat.